I decorated my newly finished buffet for the Magazine Copy Cat Christmas Challenge. I liked it a lot but it wasn't exactly what I wanted for the season...so I did another arrangement. I made two arrangements using clippings of boxwood and pine from my yard mixed with some faux greenery. 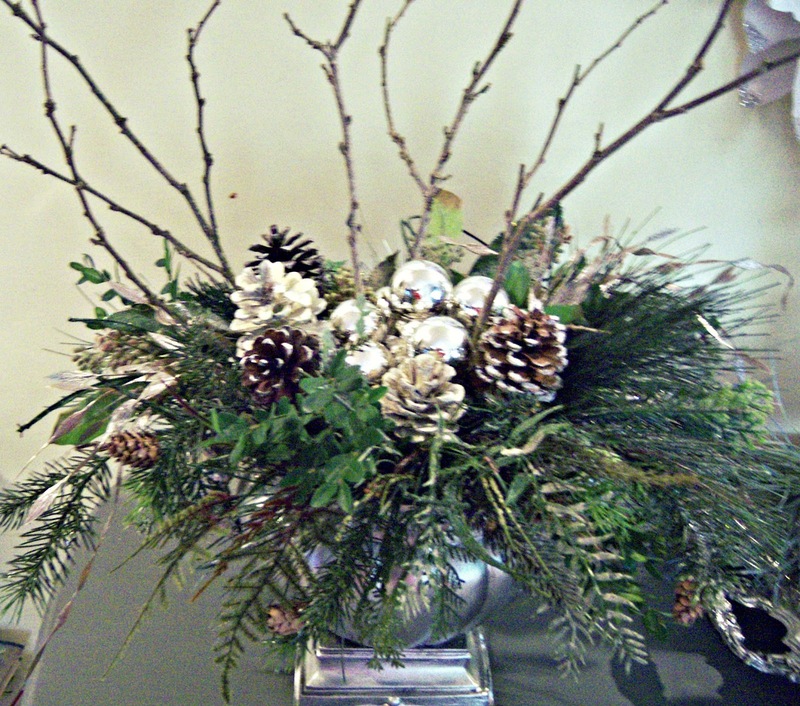 I added twigs also from the yard and added pine cones and silver balls. I made a candle scape on a silver tray in the center. The arrangement anchors my giant wreath lol. I'm giving you a tiny peek of my buffet, but not to much because I'll be revealing it later. Here are some shots of my new arrangement on my buffet aka my substitute mantle. Shabby Art Boutique for The Christmas Inspiration Party. So so pretty! I love the white colour palette and your greenery with the branches! A great look and I love the mercury glass mixed with the whites and greenery. Beautiful! Your candlesticks are gorgeous! Love your candlestick display. It is stunning! Your buffet mantel is gorgeous! Great job! Your buffet looks fabulous! I love the candlestick collection. So pretty! Love the simple mix of silver and white! Your buffet looks so elegant and beautiful! I don't have a fireplace mantle either! I absolutely love the silver candle scape. Great pairings. Glad I wandered over from Nester's! Beautiful vignette! thanks so much for sharing and Merry Christmas! Very pretty vignette! I love the silver candle scape. You did a great job making a substitute mantle! Gorgeous! I am primarily a pink and white girl, but I am coming around and liking silver and starting to incorporate some into my decor, I love it on your mantle! I have been busy looking around your blog. I like your style and your Christmas decor is lovely! Thanks for stopping by and for your kind words. Have a great day! Gorgeous! Love the dreamy white and silver mix. Ooh everything looks so pretty! I love the silver and the whites on your mantle and that wreath is so pretty. 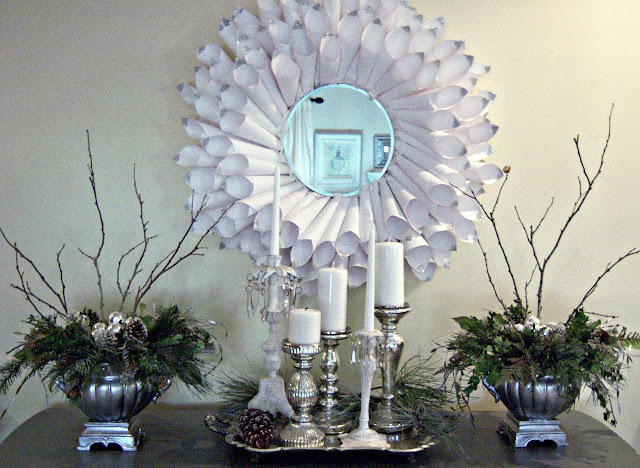 I adore the white cone wreath with the mirror insert - absolutely divine! I can hardly wait for the reveal! Everything looks wonderful! 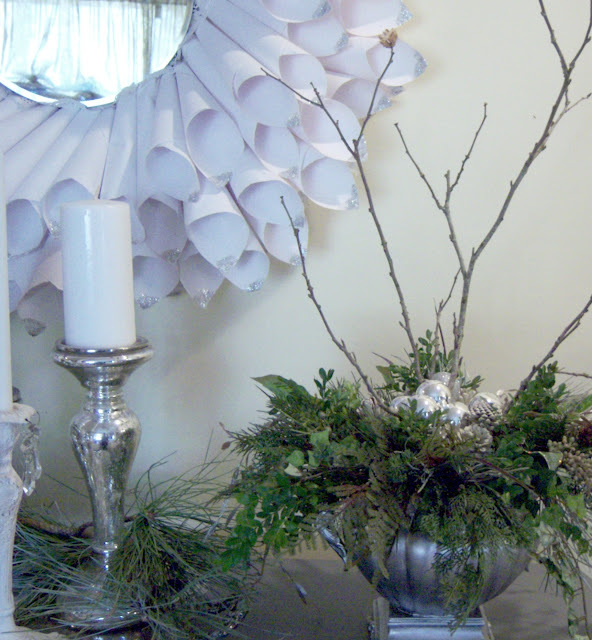 I have got to learn how to make those gorgeous paper wreaths! Thanks so much for stopping by and leaving such sweet comments. Hope you join us again next week, and link up. LOVE everything about this! The silver containers are great and the way you arranged the greenery, etc. is lovely! I love this! So elegant and festive! Oh how beautiful! So elegant and sparkling I love it. gorgeous! 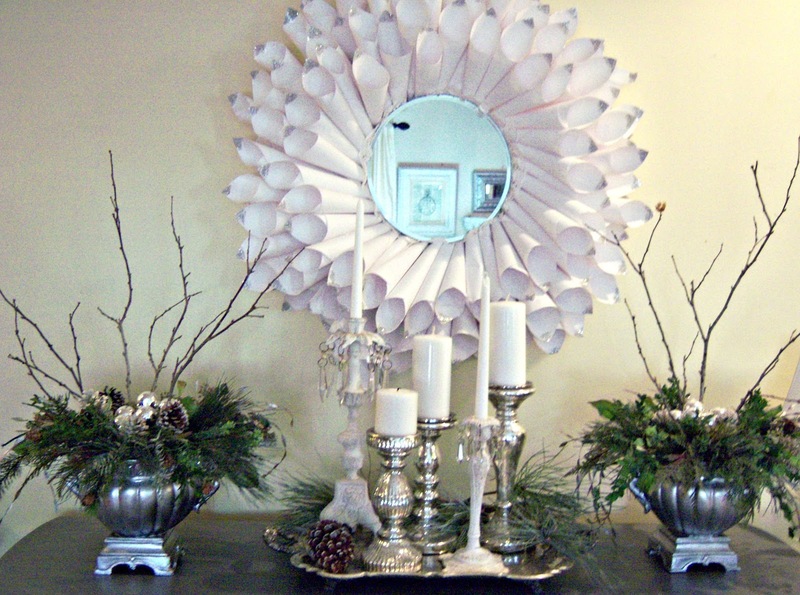 i love the paper wreath/mirror!